Bruton must be unique in the UK in being a small town with a world-class gallery on its outskirts. Galleries showing advanced contemporary art are usually located in buzzing metropolitan locations. 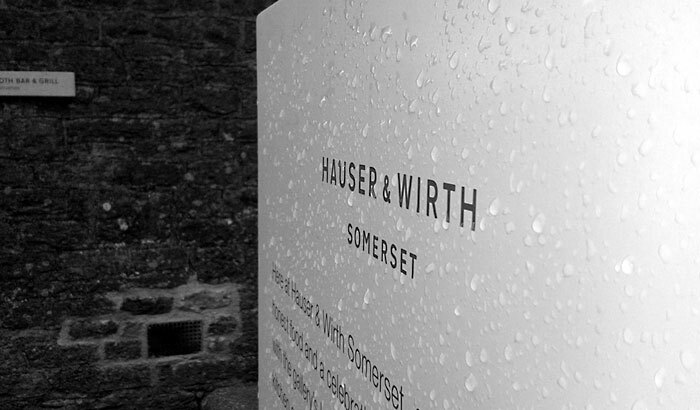 Hauser and Wirth had galleries in London, New York and Zurich long before it came up with the idea of extending out into the English countryside. The only equivalent that springs to mind is in Germany: Museum Insel Hombroich in Neuss Holzheim. Having said that, the work I want to talk about today is not ‘contemporary’, if that means of the last couple of years and cutting-edge in its nature. Hauser and Wirth is currently staging a retrospective of photographer Don McCullin’s work. The earliest images in the show date from the 1950s. The exhibition then takes us from that point, through subsequent decades, and concludes with recent landscape photography from locations very close to the gallery. Don McCullin is written about extensively elsewhere, so what I want to do here, rather than repeat any of that, is sketch out a few impressions of this show in particular. The work is arranged chronologically. You see the oldest piece on your left as you walk into the gallery: an image of gang lads in a bombed-out building in East London in 1958. You are then taken, clockwise, around the gallery, through a précis of McCullin’s career, to his most recent output. In the middle of the room are glass cases, containing memorabilia and Sunday colour supplement spreads. These are the only colour pictures in the show. All the wall-mounted photographs are black-and-white, silver-gelatine prints. Probably the first impression is one of horror. That McCullin covered wars, famines and other human tragedies is well known, as are some of the photographs, but something about seeing them in the genteel silence of an art gallery gives them renewed impact. This is perhaps compounded by the fact that most of the news we see nowadays is television news, which comes with a palliating narrative, filters out the most horrific images and gives the warning that ‘some viewers may find some of the images disturbing’ to the heavily censored material that it does show. These photographs don’t just reveal to the viewer the scene depicted; they reveal things to the viewer about him/herself. At the very least, they make us voyeurs in the anguish and terror of others, and that is an uncomfortable experience. But they also reveal to us the bubble in which we live, by showing us things outside of it. Making starkly visible that from which we are normally insulated not only makes the bubble palpable, it reveals it as fragile and contingent. Like bumping into an old, more seriously-minded friend and having a conversation of a depth that has become unfamiliar, the revelations the photographs deliver have that strange quality of being things one already knows but usually excludes from one’s consciousness. Grainy, black-and-white faces of exhausted American GIs in this or that conflict remind us that the US has been at war, overtly or covertly, more or less continuously since 1941. Images from half-forgotten foreign famines and conflicts in places not on the tourist map speak of how narrow and narcissistic we are in our measure of whose deaths matter. Impoverished people in British cities in the late twentieth century provide a dark mirror to a permanent bombardment of opulent, myth-making advertising and lifestyle images, and speak of another Britain; one marginalised, skint and hopeless. Gut-churning snapshots of African teenagers being beaten-up and tortured, moments before being summarily executed remind us of a trait bizarrely unique to us, the creatures at the top of the evolutionary heap: unnecessary, sadistic cruelty. Having said all that, the photographs are more than just their editorial content. Stepping back and looking at them from a distance, one recognises, in some, compositional and lighting effects that have overtones of renaissance paintings. For all the horror there is here, there is also beauty. Speaking personally, as an artist and photographer, myself, I have to recognise that I could not have taken these photographs. I simply would not have had the nerve. How one puts a camera into the faces of people in these circumstances is beyond me. McCullin not only has a rare talent, he has courage that few are blessed with. He has put himself into places few would go, and has placed himself at great risk in the process. In 1968, his camera stopped a bullet that he would have otherwise taken. Don McCullin is now 80 and lives in Somerset, just a few miles from the gallery. He takes moody photographs of the local landscape. I don’t blame him.